Açıklama : Chaos reigns in the Carina Nebula where massive stars form and die. Striking and detailed, this close-up of a portion of the famous nebula is a combination of light emitted by hydrogen (shown in red) and oxygen (shown in blue). Dramatic dark dust knots and complex features revealed are sculpted by the winds and radiation of Carina's massive and energetic stars. 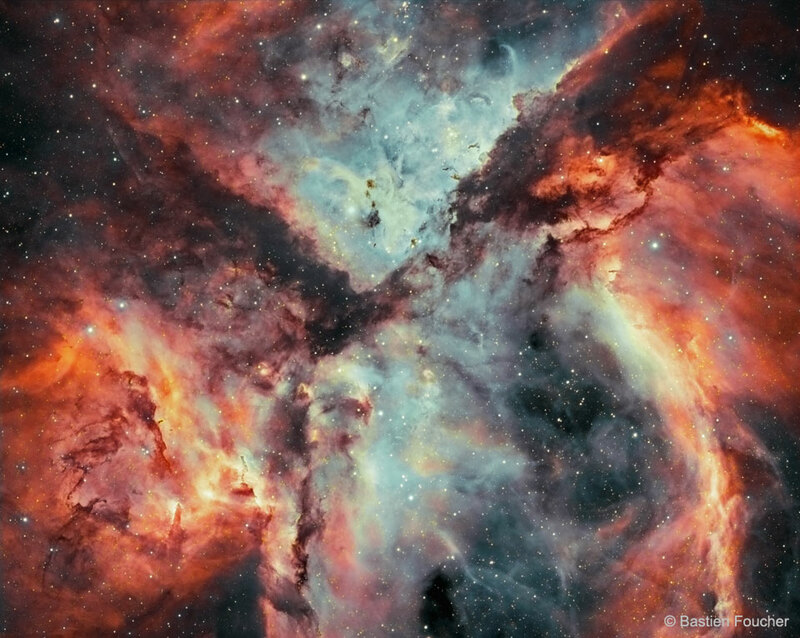 One iconic feature of the Carina Nebula is the dark V-shaped dust lane that occurs in the top half of the image. The Carina Nebula spans about 200 light years, lies about 7,500 light years distant, and is visible with binoculars toward the southern constellation of Carina. In a billion years after the dust settles -- or is destroyed, and the gas dissipates -- or gravitationally condenses, then only the stars will remain -- but not even the brightest ones.